I started blogging about a year and half ago. I had been reading constantly for the previous two years, and I found Goodreads and started writing reviews after a while. After that it all just kind of fell into place once I started my blog. Getting to share the books I love! It's so much fun getting to talk about books constantly! There isn't a main type. I tend to lean more towards the romance genre with lots of sub genres such as contemporary, young adult, new adult, ect. But I really don't discriminate against certain books, unless it's horror. I normally can't do horror! Wow, that is a hard question. I have a lot of favorite books! I will only name a few though. The Gamble by Kristen Ashley, Fallen Crest High by Tijan, Strong by Kendal Waller, Sweet Seduction Shadow by Nicola Claire, and the Elemental Assassin series by Jennifer Estep! Hmm, there have been a few good things that have happened because of it! I've found a real true friend, Jme! I found amazing books that help me escape. Well, this one is easy. Lupin and Tonks! More than any other character in any other story, I mourn their deaths. Story wise, I understand the symbolism of them dying, but that doesn't make me like it any more. And only a few weeks after their son was born. How tragic! I loved Lupin *sniff/sniff*. I'm curious as to what you mean by the symbolism of them dying? Oh I didn't even think of them and I just watched the movie a couple of days ago! I agree they shouldn't have died. I second your choice! I love Tonks and Lupin and I feel sad for their child :( I was hoping for Fred too, because he is such a great character in the series. I responded the same way, although I think I want Fred back more. 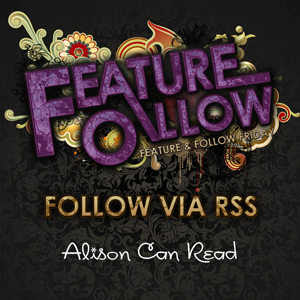 I picked a Harry Potter character for my Feature & Follow too! I loved those characters. But I haven't read the books, I've only seen the movie. They were the first ones I could think of as well! They really shouldn't have died but I guess their deaths make a good point about the cruelty of war... :'( Hope you have a good weekend and thanks for hosting! Thanks for sharing :) Hope you have a good weekend! OOOOOMG yes! I think besides Fred, their deaths killed me! After all the struggles to be together and then they finally get together, have a child and then die!!! I was in mourning. The entire book pretty much killed me! And to pretty much start off with Hedwig, I don't think I had a dry eye at all when reading that one! So many HP characters too! One made my list also, so I'm right there with you. Old follower! I agree. I would add them to my list as well. It was heartbreaking. Hey Alison! Hope you had a great weekend.